This fall is certainly a time of transition for Cannon County Schools. 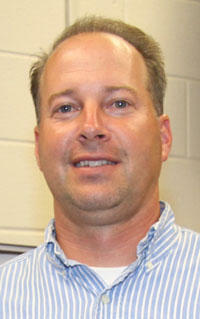 Along with new curriculum and a new system Director, Cannon County High School has a new principal in Tim Knox. Mr. Knox has worked at CCHS for 13 years, beginning in 1997 as a social studies teacher. Knox gradually assumed other administrative and athletic responsibilities including Assistant Principal and Athletic Director, positions which undoubtedly familiarized him with the inner workings of the school. With his experience and qualifications, Mr. Knox's new position seems to fit like a glove. After graduating Ezell-Harding High School in Nashville, Mr. Knox studied at Dave Lipscomb for his bachelor's degree and later at MTSU where he received a master's degree in education. For two years Knox and his wife lived in nearby Murfreesboro while he worked at CCHS. They finally moved to Cannon County in 1999 after Mr. Knox became youth minister at the Woodbury Church of Christ. "We we're spending so much time in Woodbury and we really loved the area," he explains. About 750 students will attend Cannon County High School this year. The school boasts an impressive 84% graduation rate, a full 14% higher than the state average and about 15% above the national average. "We're very proud of our graduation rate," Principal Knox says "but it is tough to improve on." Beginning with 2009's incoming freshmen, graduation requirements will become much more rigid and demanding -- hopefully to better prepare more students for college. On the day of freshman orientation, Knox and other CCHS wore t-shirts with "got credits?" printed across the back. "That's our slogan for the incoming freshmen, we want to make sure they understand the new requirements." Knox looks forward to his first year as principal. "Everyone is refreshed and rejuvenated after the break. It will be nice meeting all the new faces, I really think we're going to have a great school year." After a number of in-services, orientations, and half-days CCHS will have its first regular day of instruction on Tuesday, August 11th.